Whatever type of embedded system you create today, you will need to update it tomorrow. Either because there are new security patches or simply for an improved version of your application. But a new update could just mean one line of code was changed and ideally should not lead to a complete reinstallation of all software present on your device. Therefore, it would be better to only update the differences between two versions of software to install. Hence, this type of technology could limit the bandwidth usage for each update, limit the installation time and consequently the overall offline time of your system during an update. A great solution that addresses all these points is called OSTree. OSTree is a system for versioning updates of Linux-based operating systems. It's both a shared library and a suite of command line tools. It features a "git-like" model for committing and downloading bootable filesystem trees, and a layer for deploying these trees and managing the bootloader configuration. From the documentation, “OSTree is deeply inspired by git; the core layer is a userspace content-addressed versioning filesystem”. Git tracks content – files and directories. 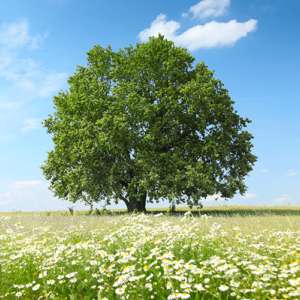 It is at its heart a collection of simple tools that implement a tree history storage and directory content management system. It is simply used as a Software Configuration Management tool, not really designed as one. When most Software Configuration Management tools store a new version of a project, they store the code delta or diff. When Git stores a new version of a project, it stores a new tree – a bunch of blobs of content and a collection of pointers that can be expanded back out into a full directory of files and subdirectories. If you want a diff between two versions, it doesn’t add up all the deltas, it simply looks at the two trees and runs a new diff on them. This is what fundamentally allows the system to be easily distributed, it doesn’t have issues figuring out how to apply a complex series of deltas, it simply transfers all the directories and content that one user has and another does not have but is requesting. It is efficient about it – it only stores identical files and directories once and it can compress and transfer its content using delta-compressed packfiles – but in concept, it is a very simple beast. Git is at its heart very stupid-simple. For instance, on Figure 1 between version 1 and 2, File A and C have been modified. When pulling the version 2 you will receive a compressed patch including just the differences between A and A1 and just the differences between C and C1. This patch includes a signature for A1 and C1 and it will be used to validate the success of the update. Then OSTree will generate a new directory with a copy of File A and will apply the patch to update it to A1. The same will be done for C with the patch to update it to C1. B has not been changed and will be directly reused. As a last step, OSTree will check whether the signature computed after the update matches the one received within the compressed patch. If not OSTree will discard the update and roll back to File A and File C. In case both signatures match, the update will be flagged as successful and used when your device will be restarted. By using 2 steps with first a copy and then an update, it makes sure in case of power failure that your system will boot using either A or A1 and C or C1. One downside of differential update is the RAM usage during the update, hence the file to be updated and the patch are both loaded in RAM before they are merged together. Which means that you need enough RAM to store File A and the update A1. Another downside of OSTree is in the case the filesystem is corrupted it will be impossible to update the device. Therefore, you should always provision an alternative way to restore a corrupted device. For instance, by using a dual partition scheme but that’s a different story and will be explained in a different blog article. Knowing more about how OSTree manages new updates, let’s dig on how it internally stores them and links them to the “final” filesystem. 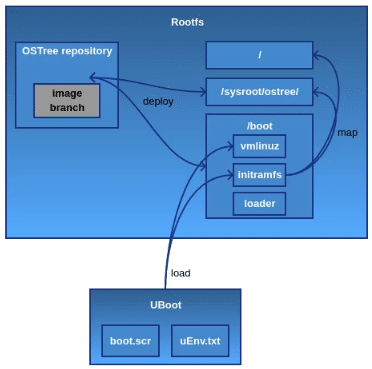 OSTree only supports recording and deploying complete (bootable) filesystem trees. On each client machine, there is an OSTree repository stored in /ostree/repo, and a set of "deployments" stored in /ostree/deploy/$STATEROOT/$CHECKSUM. Each deployment is primarily composed of a set of hardlinks into the repository. # find / -name "*Cinematic*"
When the device will be restarted the hard link to the “real” filesystem will be modified to point on this new path. Because an embedded device has a limited mass storage, for each new commit on the server side, only the two last commits are stored on the embedded device (the previous one is kept to easily roll back to the previous version even if no connectivity is available). In this way, the size used by OSTree to store your different files is always kept to the minimum. It provides everything you need to generate OSTree tools directly into a build using Yocto. But of course, you will need to tweak a bit the configuration of this meta to adapt OSTree to your needs. Contains everything to prepare and maintain the OSTree repository. OSTREE_INITRAMFS_IMAGE` - initramfs/initrd image that is used as a proxy while booting into OSTree deployment. Do not change this setting unless you are sure that your initramfs can serve as such a proxy. SOTA_PACKED_CREDENTIALS (path to your credentials.zip from ATS Garage). If this variable is not defined, all remote operations are skipped. But all modifications are still committed to your local OSTree repository. Creates an `otaimg` bootstrap image, which is an OSTree physical sysroot as a burnable filesystem image. At the point you should have set up OSTree in your Yocto build environment and generate a new set of images ready to be programmed on your target. The next step is to start playing with it! How to use OSTree to run differential system updates on your embedded device? If OSTREE_BRANCHNAME is set in local.conf, that will be the name of the branch. If not set, it defaults to the value of MACHINE (e.g. qemux86-64). ==> checking the new release. ==> (*) indicate the current release used. How does OSTree swap between boot configurations? To swap the contents atomically, if the current version is 0, OSTree creates /ostree/boot.1, populate it with the new contents, then atomically swap the symbolic link. Finally, the old contents can be garbage collected at any point. OSTree implements a special optimization where you want to avoid touching the bootloader configuration if the kernel layout hasn't changed. This is handled by the ostree= kernel argument referring to a "bootlink". But you do need to update the bootloader configuration if the kernel arguments change. In this case, adding bootargs when deploying the last release forced ostree to switch the /boot/loader symlink. How does your system boot when using OSTree? At last, you will need to change some settings in U-Boot. OSTree already provides some elements in the file /boot/loader/uEnv.txt. umount: /run/initramfs: target is busy. If you remove packets, disk space won’t be immediately released after the new commit. Your packets will still be referenced by the rollback commit. Adding new packages and some big files on the disk won't impact the boot time as long as these files exist on the filesystem. Filesystem limitation: There can be no hardlink between 2 partitions. This limits locations where files can be deployed. Therefore, this kind of update system is extremely interesting when the amount of data transferred to update an embedded system should be limited at its minimum (for instance if you use a satellite connection and pay per Megabyte transferred). Moreover. when the online time of a system is critical, the fact to only update the modified part of your software speed up drastically the whole update and reboot process. The size of the RAM available in your system needs to be at least the size of the biggest file you will update plus the size of the biggest patch you will apply. It is impossible to restore a device with a filesystem corrupted. Hence, if the bandwidth usage or the speed to update your system are critical then OSTree is your best option. However, if a 100% reliability is as well one of your hard requirement, you should consider tweaking OSTree to use a dual partition update system. By using such a system, you will have the guaranty that even if one filesystem is corrupted your system can always boot on the second one and restore the corrupted one. That’s the beauty of it. If you found this article interesting you can share it or contact me for further questions.